Check out a beautiful one-owner home that is simply awaiting new owners!! 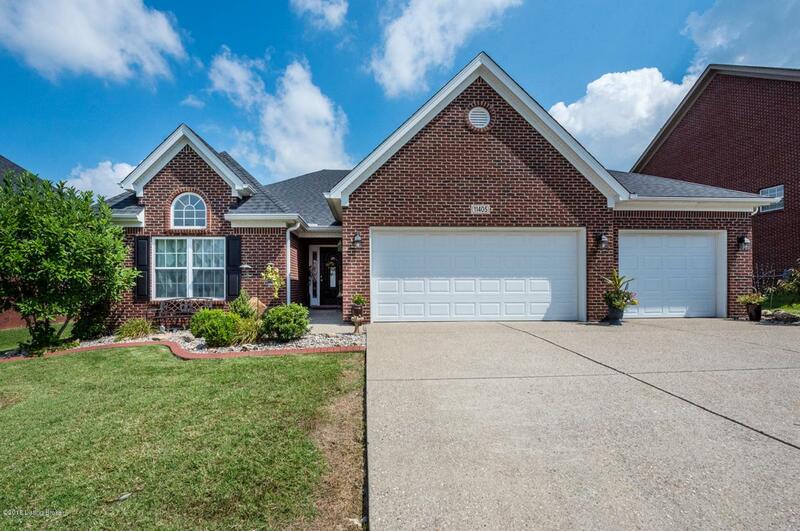 This all brick ranch home boasts over 2,000 square feet all on the main level. There is loads of space and has zero steps into the home for easy accessibility. Walk in and enjoy a beautiful entry and open floor plan with soaring nine foot ceilings throughout the main floor. This home has a formal dining room with decorative columns, tall ceilings and plenty of space for a large dining table and hutch. The living room is open to the eat in kitchen with a wall of windows overlooking the rear yard. The kitchen has stainless steel appliances, ample cabinet and counter top space, with an additional butler pantry area to the side.This gives excellent additional space for the home chef or a coffee bar. The separate laundry room is just off the kitchen and is close proximity to the three car garage. The master bedroom is large in size and has an en suite bath with double bowl vanity, whirlpool tub and separate shower. Just off the master bath is the large walk-in closet that is sure to please!! The two spare bedrooms sit to the front of the home for privacy and both can share the additional full bath in the hall. The rear yard has a large patio with additional concrete added during construction and is fully fenced. Come take a look today.